Long time readers of my blog might remember that I began making my own yogurt a little over two years ago. One of the things I discovered during my first year of yogurt making was that in order to successfully maintain a yogurt culture I had to establish a yogurt making schedule…basically, I have to make yogurt every 5 to 7 days. One might think that this would become a hassle or a nuisance, but it never really has. Making yogurt is so simple that I am able to make it once a week while I’m brewing my coffee and cutting up my fruit for breakfast. The only drawback that I have encountered is occasionally I find that I have more yogurt than I can reasonably consume. There are worse problems to have. Since I eat coffeecake for breakfast most mornings, it has been an easy thing to use up some of the excess in a yogurt based coffeecake of some kind. Of course it isn’t possible to have too much cake... Nevertheless, early last winter I decided I wanted to stretch my horizons a bit, so I started poking around on line for recipes that used yogurt. In the course of my search I found an interesting looking whole wheat, cornmeal and molasses quick bread by Mark Bittman. At this point I’m not sure why it was, but for some reason Bittman’s bread put me in mind of Irish soda bread. Since I like Irish soda bread a lot, I reinvented his loaf in that style. The ingredients in his original bread are not really very soda bread-like at all. 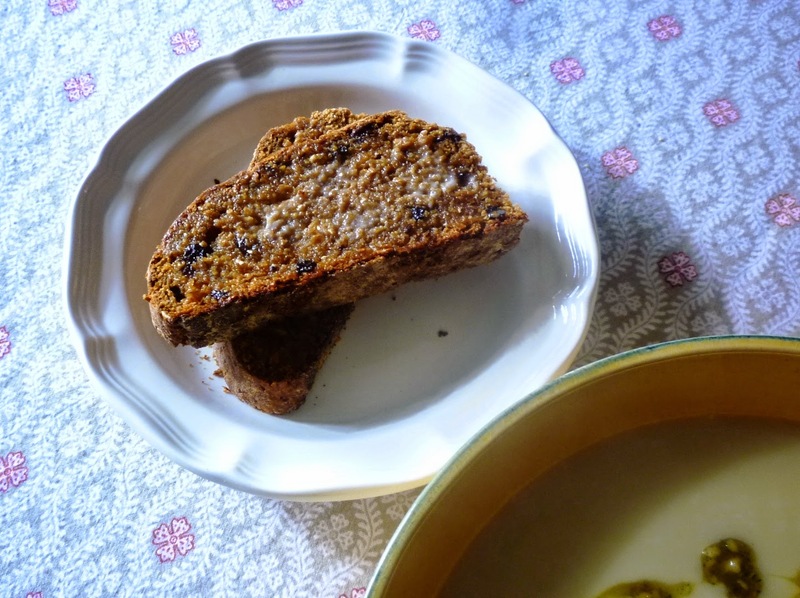 Instead, they are similar to Boston Brown Bread—a traditional New England steamed quick bread that includes whole wheat flour, cornmeal, molasses and currants. I have given a nod to both kinds of bread by christening my bread “Boston Brown Soda Bread”. While probably not to everyone’s taste, I love this bread. It has an addictive nubbly texture and a complex flavor. 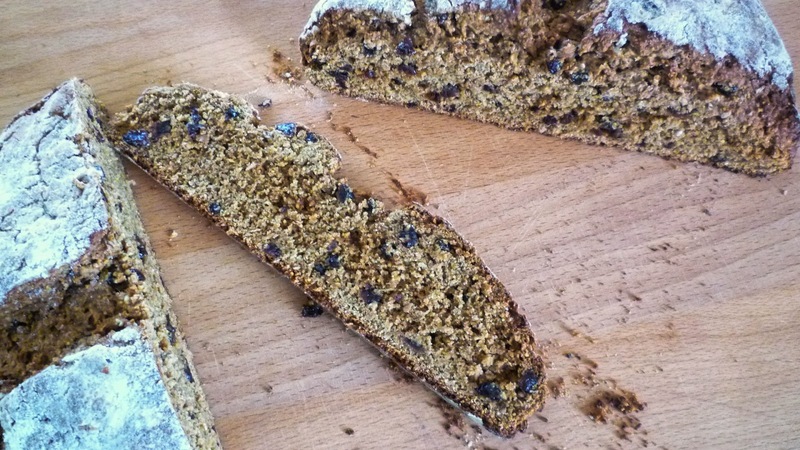 It is sweeter than most soda breads—mostly from the generous quantity of molasses and currants, but also, I think, from the addition of cornmeal. The day it is baked, it is delicious sliced and buttered. The day after, it makes wonderful toast (buttered, of course). Either way it makes a fine lunch with cheese and fruit. It is also good with a salad (lettuce, chicken/tuna, vegetable…) or a bowl of soup. While sweet, it isn’t as sweet as the things I normally like to have with my yogurt and fruit at breakfast, but if your morning tastes run toward things that aren’t quite so cake-like, I am sure it would make excellent breakfast toast…perhaps with orange marmalade (and butter). The first time I made the bread I made it with some King Arthur Irish Wholemeal Flour. It seemed the right thing to do since I was making soda bread. I liked it so much that I wanted to post the recipe. Since most people don’t keep this rather specialized flour on hand I decided to see how it would work with regular (American-style), stone ground whole wheat flour. It was surprisingly inferior….a bit dense and frankly dry. Even a nice smear of butter didn’t help much. Since I still wanted to post the recipe, I decided to recreate the more coarsely milled style of Irish wholemeal flour by adding miller’s bran and toasted wheat germ to unbleached all-purpose flour and a small amount of whole wheat flour. toasted wheat germ, wheat bran, stone ground whole wheat, and all four mixed together. My results were good. In the picture below, the American style of whole wheat flour is on the right. You can see that even though it is stone ground, it is still very finely milled. The Irish wholemeal and my mix are in the center and on the left. Since it has been a year since I took the pictures, I can’t remember which is which (although I would guess that the King Arthur flour is on the left). The fact that they look nearly identical is a good thing since it was my goal to reproduce the look and texture of the Irish wholemeal with my blend. I share all of this mostly because these kinds of little details fascinate me. Good results are always in the details. But beyond that, I didn’t want someone to look at the recipe and decide to simplify it by making it with all American-style whole wheat flour. I can pretty much guarantee that the results would be less than satisfactory. (I was surprised at the difference a more coarsely milled flour made.) In any case, if you like soda bread, you should give this version a try. Even if you don't have extra yogurt hanging around.... I think this bread's worth a run to the store to get some. In a large bowl whisk together the first seven ingredients. Add the butter and toss to coat with flour. With fingertips rub in the butter until the mixture resembles coarse meal. Add the currants and toss to combine. In a small bowl, whisk together the yogurt and molasses. Make a well in the center of the dry ingredients and pour in the liquid. Using a rubber spatula, mix by scraping down the outside of the bowl and drawing the spatula into the center. Repeat this motion, rotating the bowl after each pass until the dough is moistened evenly and has come together. There will still be flour visible in and on the dough, but there shouldn't be any loose in the bottom of the bowl. The dough should feel quite soft when pressed...almost too soft. Scrape the dough onto a floured counter and sprinkle lightly with additional flour. Knead briefly, adding more flour if necessary and using a bench scraper to prevent sticking (dough should remain soft and a bit sticky), just until the dough comes together into a ball. This should take less than a minute. Place the ball on a baking sheet that has been sprinkled with flour. Pat the ball of dough out into a 7-inch round. Sprinkle the dough with additional flour and with fingertips spread lightly over the round. With a sharp knife, cut a shallow (about 1/2-inch deep) X in the top of the loaf. Bake the bread in the middle of a preheated 400° oven until browned, firm (but still springy) to the touch—about 30 to 40 minutes (an instant read thermometer inserted into the center should read about 195° to 200°). Cool the loaf on a rack for at least an hour before slicing. I use a cushion-air insulated baking sheet for this loaf. The strong bottom heat in my oven overbrowns the bottom of the loaf when I use a standard baking sheet. If you have the same problem with your oven, but don't have any insulated sheets, simply stack two sheets on top of each other. If you have access to it, you should use Irish-style wholemeal flour instead of my mixture of all-purpose, wheat bran, wheat germ and American whole wheat (the first four ingredients in the recipe). This style of flour produces a beautiful loaf. You can purchase this kind of flour from King Arthur. If you use Irish wholemeal flour, use 300 grams total (2 1/2 cups).